"Timeless tone" is tone that has historic precedent and is still enjoyed today. That it speaks to us on many levels means such tone will be around forever. We apply advanced technology to tube guitar and instrument amplifiers to create refined, modern products for ourselves and for others, without losing what is essential to our constructions: tone. TUT6 builds upon the lessons of TUT4, delving deeper into discussions begun there, while introducing completely new topics. DC Power Scaling is detailed; its evolution and the many options it allows, including detailed operation of London Power's present and future DC Power Scaling kits. Lots of regulator circuits; voltage clamping; bias manipulation; circuit stabilization; quirks of technology and how to tame them. Fixed-bias, cathode-bias and switchable bias are dealt with, as are issues surrounding addition of extra Power Scale controls, automatic signal limiting, and circuit "tweaking" that allows complete optimization of performance. Class-G tube amps are not something you'll find in any historic text. Now, you can build a 100W with waste heat like a 20W amp. Extend tube life without affecting tone. Huge dynamic headroom does not have to incur penalties of performance or high power consumption. Z-B-X amps: how to get push-pull operation with a single tube. Revolutionary technology plus some less-than-revolutionary alternatives. 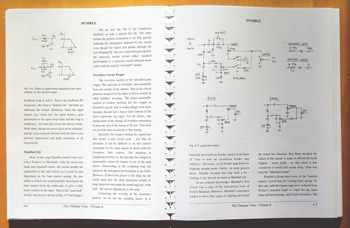 The evolution of a design most people would consider impossible, but laid out with practical circuits good enough for hifi. The basics of Dumble amps. Why certain things were done in certain ways, and why we should change some and leave others alone. There were many variations in Howard's designs but some key points were common to all. We dig through the hype and reveal the essence of design. 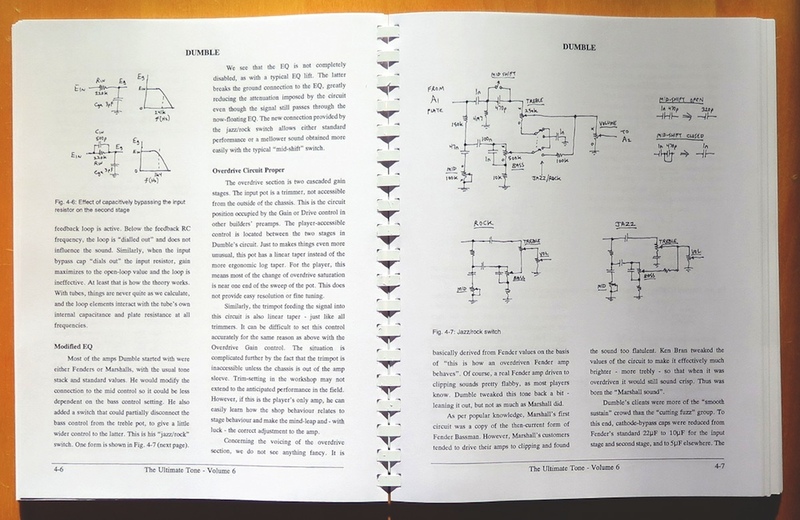 The 400W amp craze: how to design a big amp. Really, a tutorial on output stage design taken to an extreme, looking at different tube types as well as loading and voltage environments. Plus, the impact each output stage choice has on our power supply, chassis and layout. Common tube types are considered, along with some less common types, including: 6CA7, 6L6, 6V6, 5881, 6550, EL-34, KT-66, KT-77, KT-88, KT-90, 811A, 572B, 845, EL-509, 3CX300 and 4CX250. Sustain: How to enhance the sustain of notes both through the output stage and other voltage-amplifying stages. A continuation of the "Sag" chapter of TUT4 but using the "DC-style" of the DC Power Scale circuits. Circuit methods with non-critical components is emphasized. AC Mains Control: Filtering, range selection both manual and automated, inrush current limiting, DC blocking - yes, "DC" on the mains! See why big manufacturers don't just use a "power switch" anymore. More Gain: The evolution of high-gain preamps and how to control their noise, sustain, compression and basic tone. From the 800, to Recto and SLO, see what is important and what is not.